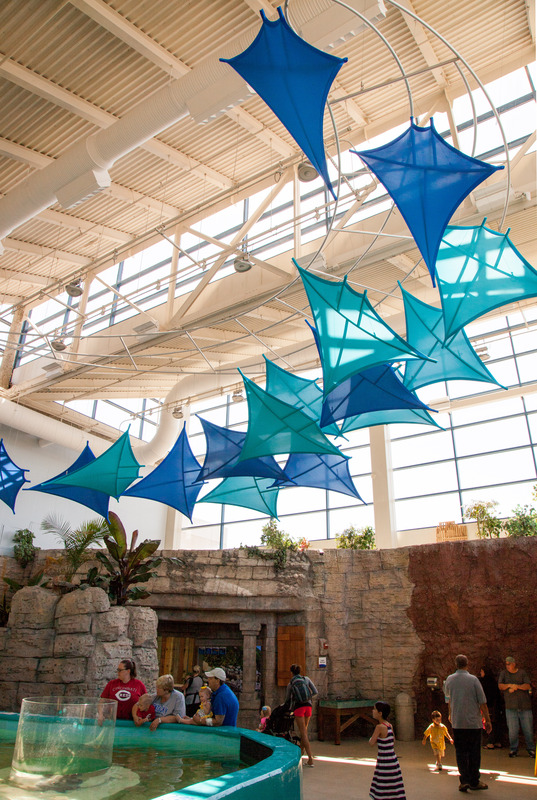 Several years ago we did a really fun project with the Newport Aquarium in Newport, Kentucky. They were renovating the viewing theater for their giant shark-tank, Shark Ray Bay, and invited Transformit to create a fabric surround to frame the large acryllic window into the tank. I like to think our designers were channelling their inner Neptune when they framed the tank window with a dynamic "splash." 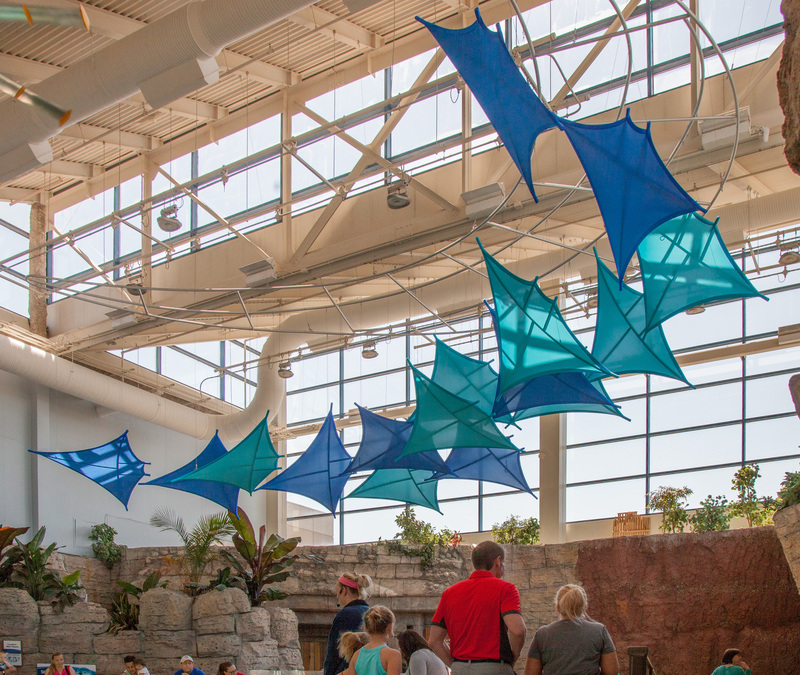 When the aquarium was designing their latest exhibit, Stingray Hideaway, they wanted an overhead shade structure that tied in thematically to the exhibit. We were delighted when the Newport Aquarium called us to work with them again and collaborate on their idea. 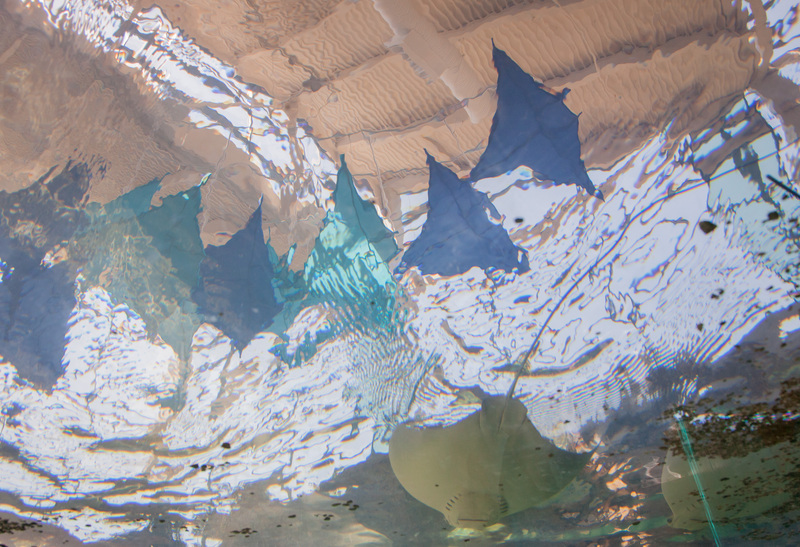 For Stingray Hideaway we created a custom fabric sculpture of sixteen Cownose Rays swimming in a school overhead. Each ray measures six feet long by eight feet wide and one foot tall, the completed piece is 34’ long by 29’ wide by 10’ high and its installation overhead rises from 15’ to 25’ above the floor. Newport Aquarium’s new Stingray Hideaway exhibit was being constructed in an 85’ x 55’ interior exhibit space with two tall walls of windows and a clerestory 40’ above the floor. 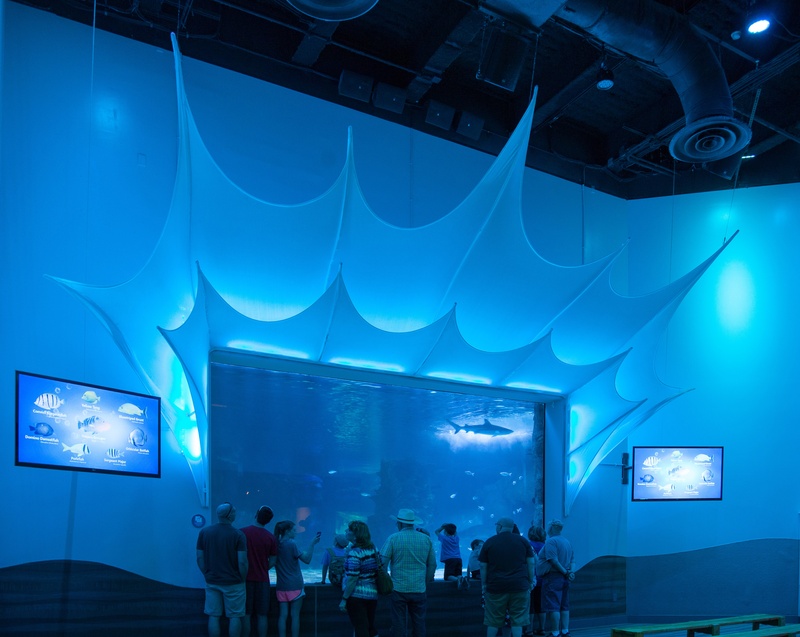 The exhibit designers Jeff Kraemer and Erica Rutledge with Herschend Family Entertainment (HFE), owners of the Newport Aquarium, wanted to create some shade in the room while extending the stingray theme into the overhead space. Additionally, any installation needed to comply with existing load bearing specifications of the building. A lightweight fabric structure was the ideal solution for the project. HFE’s initial concept for an overhead fabric structure included very detailed sculptures of Cownose Rays. The execution of that concept exceeded the project’s budget, so Transformit designer Jonathan Crowe designed a simpler version of the Cownose Rays that retained the general shape of the rays and was cost effective to fabricate and install, which enabled the project to proceed. A site visit was done to confirm measurements, installation access and rig points, and Crowe worked with HFE’s exhibit designers to position the rays in a sweeping curve, revising the initial approval drawings accordingly, to evoke a school of swimming rays. Given the humid environment and salt-water conditions of the installation space in the aquarium, the fabrics were treated with Nanotex® by Applied Textiles to improve moisture resistance and all installation and rigging hardware is stainless steel. The Stingray Hideaway exhibit opened in May of 2017 and quickly become one of the most popular attractions at the Newport Aquarium. One of the features of the 17,000-gallon salt-water stingray touch-pool are tunnels and windows beneath the pool so visitors can view the rays – Southern Stingrays, Cownose Rays, and Yellow Stingrays – from below and get a feel for what it's like to be in their midst. 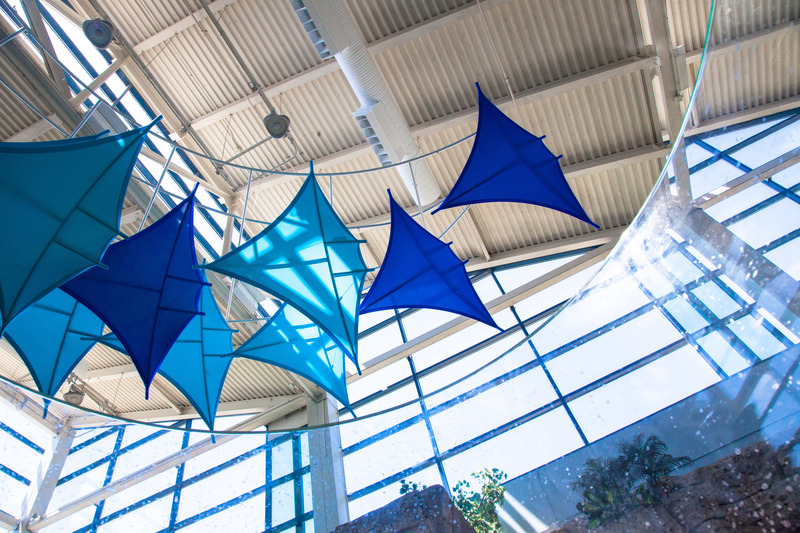 Similarly, the fabric sculpture of a playful school of sixteen Cownose Rays swims overhead above the pool, extending the immersive experience into the exhibit hall itself.